Once known as the District of Columbia Washington DC is one of the most important and famous cities on the planet. 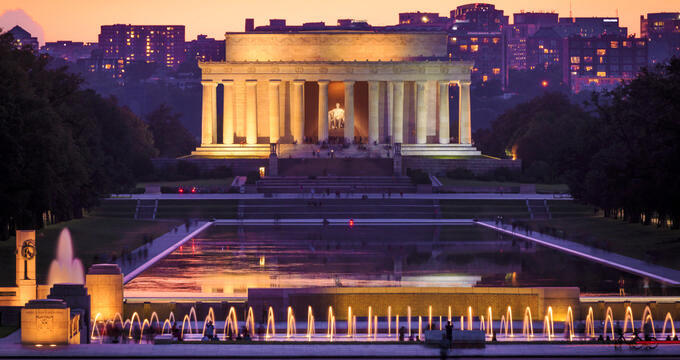 Named after George Washington, the first ever President of the United States, Washington DC is the nation's capital and home to dozens of hugely important historical sites and monuments. Unlike any other location in America, Washington DC is not part of any state; it is instead a federal district located between the states of Maryland and Virginia. Often just referred to as DC, the city covers an area of 68.34 square miles and has a population of approximately 693,000 people, with over 6.1 million in the surrounding metropolitan area. The creation of Washington DC began in July 1790 when Congress passed the Residence Act, allowing for the construction of the United States' capital city along the Potomac River. George Washington himself chose the plot of land, with Maryland and Virginia giving up parts of their territory to form the new district, which was initially made to cover 100 square miles. Additional acts and laws had to be passed to organize control of the district, and it has been the capital of the United States ever since, despite being invaded and ransacked by the British during the War of 1812. The city has grown exponentially over the years and is iconic both in the United States and internationally, housing the White House, the Washington Monument, the Lincoln Memorial, the Smithsonian, the Washington National Cathedral, and many other historic monuments and locations, helping DC to attract over 20 million tourists each year. Elevation is an important geographical statistic that denotes how high or low an area is in relation to mean sea level. It can be used when talking about towns, cities, mountains, lakes and more, and the elevation of a location has a direct effect on its climate. The elevation of Washington DC varies all around the city, with the lowest point being at 0 feet (0 m) in the waters of the Potomac River, and the highest point being at 409 feet (125 m) above sea level at Fort Reno Park, located in the Tenleytown neighborhood in the northwest section of the district. The average elevation of Washington D.C. is 150 feet (50 m). The average elevation all around the United States is 2,500 feet (760 m), so Washington DC’s elevation is much lower than the national average. The American capital’s elevation is also lower than the average elevations of its surrounding states of Virginia and Maryland. Virginia has an elevation of 950 feet (200 m) and Maryland has an elevation of 350 feet (110 m). The highest point in Virginia is Mount Rogers, which is located at an elevation of 5,729 feet (1,746 m), while the highest point of Maryland is Hoye-Crest, which is situated at an elevation of 3,360 feet (1,024 m). Many other major cities around the United States are located at relatively low elevations, just like Washington DC. Los Angeles, for example, is located at an elevation of 285 feet (87 m), while New York City’s elevation is measured at 33 feet (10 m), Houston is situated at an elevation of just 80 feet (32 m), and the city of Chicago is located at an elevation of 594 feet (181 m) above sea level. The relatively low elevation around the city of Washington DC is due to its low-lying coastal location. Washington DC has hot summers and cool winters, with quite wet conditions all through the year. Snow can fall from anytime beginning in November and running through to early April, and a few inches of rain are expected to fall each month. The coldest month of the year in Washington DC is January, which has average highs of 43°F (6°C) and lows of 29°F (-2°C), while the warmest month of the year is July, with average highs of 88°F (31°C) and lows of 71°F (22°C). Millions of people visit Washington DC each year, with the city having a lot of different monuments and landmarks to see. The White House, Lincoln Memorial, Smithsonian, Washington National Cathedral, and Capitol Building are some of the most popular tourist spots to snap photos. The historic Georgetown district is also very popular with visitors, and the Potomac River and Chesapeake and Ohio Canal offer many recreational opportunities for activities like kayaking, cycling, scenic walks, and more. In short, there’s a lot to see in Washington DC for visitors of all ages.